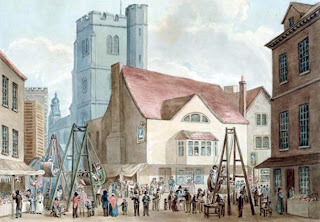 If you were possessed of a free afternoon in London, in the years between 1803 and 1830, an interesting outing could be had by attending at Weeks's Mechanical Exhibition (or Museum) in Tichborne Street near the Haymarket. The Exhibition was principally composed of clocks, and the interesting mechanical novelties that had grown from their makers' ingenuity. In the late 18th century, several clockmakers and artisans turned their attention to expanding on the little birds, and moving figures that decorated fine clocks. The mechanical wonders they produced were called 'automata'; if human in form, they were sometimes called 'androides'. The illustration above shows two automata which had been displayed a few years previously to this publication: a lady with a horn, which played several tunes, and on the table, a carriage drawn by birds which moved in a natural manner. Weeks' museum contained, besides his own constructions, the work of eighteenth century mechanics James Cox, and John Merlin, originally from Liege. They had had their own museums in the late 1700s, and Weeks bought some of their stock as they retired. In 1819 Richard Rush, American ambassador to London, visited the Weeks' Exhibition, where he was told that the clocks in the display were alone worth 30,000 pounds. Many of the automata had been made for the Chinese market, but trade with the Orient faltered and so Weeks' Museum took shape. The machines exhibited were by all accounts astonishing. They included: a silver swan..that swam on 'artificial water', life-size musicians, self-opening umbrellas, a caterpillar that fed on the foliage of a golden tree, a ouse made of Oriental pearls, and a 115 piece tarantula. There was also a figure of an old woman who came out of a cottage, on crutches, and walked about in a natural manner. The famed Maillardet had a display of automata in London until 1817. The Two Nerdy History Girls talk about his work here. His pieces included a wonderful "Draughtsman-Writer" which you can read all about here. This incredible machine still produces intricate drawings and poems. Glimpses of other automata have come down to us. The 'silver dancer' made by John Merlin was seen by Charles Babbage in his youth. Read more here. Weeks bought the dancer in the early 1800s but never displayed it. An 'artificial duck' complete with digestive processes, was built by Vaucauson in the 1700s, among other wonders. And of course, where there are wonders, there are con artists. In 1770, Wolfgang von Kempelen unveiled his mechanical chess-player, now called "The Turk". It purported to play chess against anyone, and indeed it did, but by means of a person concealed in the desk below it. You can read more about it here. From about 1818 to 1825, The Turk was displayed in England by Johann Malzel. Weeks' Mechanical Exhibition did not outlast his death in 1834. Most of his treasures were auctioned. The remainder were sold for a pittance at Christie's when his last surviving son died in 1864. The silver swan, however, survived and is now at Bowes Museum at Barnard Castle. It still offers an interesting afternoon outing. His feat was notable, but he was not alone in undertaking such a challenge. Pedestrianism was all the rage. 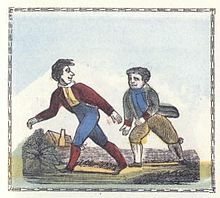 While pedestrianism could include actual foot races, it most often pitted man against the road, mile after mile of walking. In the 1700's, Mr. Foster Powell had been famous for his walking exploits. 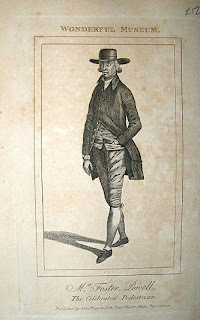 He was born in 1736 and was still walking, and winning every wager on his skill, in 1790. In that year he walked to York and returned to London in slightly less than five days and eighteen hours. Late that same year, he was "theatrically crowned at Astley's Ampitheatre." He had begun life as a law clerk, making expeditions on foot about his employer's business! She was apparently not alone among women in taking up this exercise. People trained for pedestrianism, one expert likening the training to that undertaken for pugilism. The healthy nature of the exercise was applauded, and admired even by those without the slightest inclination to walk anywhere. Race walking, as included in the Olympic games, apparently has its origins in the pedestrianism of the Regency era. Who knew? 'Everyone loves a fair', and that affection extends back as far and farther than the Regency era. The lives of the middle and lower classes of Britain in those years consisted of hard work, and plenty of it. Their world could be bleak and colourless, and a fair was a marvel of new sights, sounds and tastes. Owen's New Book of Fairs (a Google Books down-load) was a long-lasting publication often reprinted and updated. It purports to list every fair held in England and Wales, with their dates and the chief object of their business. It lists fairs by location (county and town) and by date (there is at least one fair for every day of the year). The majority are market-type fairs for cattle, horses, sheep etc. But it is the ones that are not animal based that are the most interesting. 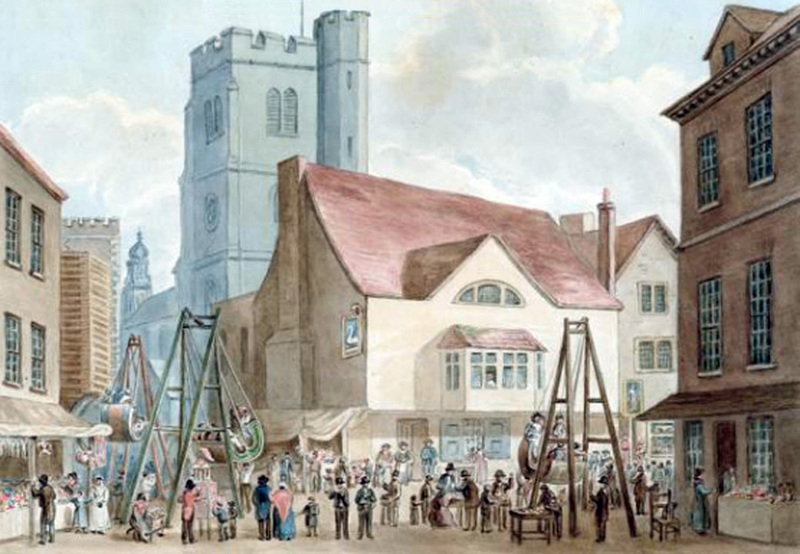 A quick survey reveals Farnham Fair on August 21, for cheese; Blytheborough Fair on April 5 for toys; Kenelworth Fair on April 30 and September 30 for cattle and pedlary; Wigton Fair on March 25 for merchandize and toys; Chapel Row Fair (near Reading), July 30, for pleasure, toys, etc. ; Winslow Fair on October 10 for hiring servants. Hiring (or mop) fairs are not so numerous as I expected, fairs listing toys as their prime item are surprisingly plentiful. 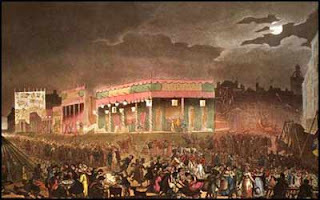 In 1822 an account of Bartholomew Fair depicts the large number and array of these shows: it lists five circus booths, four menageries, a number of theatres, peep shows, freak shows, glass blowing acts and a number of exhibition shows which brought the tally of establishments exhibited in 1822 to twenty-two. Every fair had the potential to dissolve from boisterous high spirits into vice and crime. 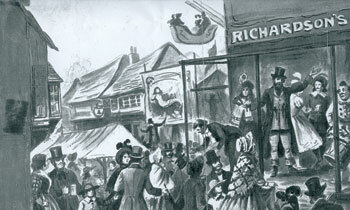 Camberwell (London) Fair (read more about it here) has been described as "All in all a great sprawling rowdy bundle." Peckham (London) Fair was plagued by a gang of pickpockets who assaulted folk as they were leaving the fairgrounds. In 1815 forty-five cases of felony, misdemeanour, and assault were committed in only a couple of days at Bartholomew Fair. Attempts were made to police the great fairs but, even with the advent of organized police forces, they were a law unto themselves. By the 1840's they were being shut down. The market fairs, with their legitimate business, continued but the shows and pedlary that accompanied them were tightly controlled by the 1850's. Some of the old fairs have been revived in recent years, and North America continues the fair-going tradition with the great state fairs in the U.S. and the Canadian and Pacific National Exhibitions north of the border. I hope you can take in the sights of a fair this summer; my city has one--I think I'll attend!